Matured metaphase II (MII) oocytes are destined for fertilization and, therefore, represent essential cells in human reproduction, as well as assisted reproduction technologies (ART) when natural reproduction fails. However, oocyte maturation is not strictly synchronized at MII, and oocytes undergo undesirable changes related to post-ovulatory ageing. These changes ultimately manifest in cell death (i.e., apoptosis or lysis) or parthenogenetically activated embryonic development [1, 2]. Accordingly, age-related signalling has been extensively studied, and various substances with oocyte protective effects have been tested [3, 4]. Gasotransmitters, particularly hydrogen sulfide, represent potent signalling molecules involved in the regulation of oocyte maturation and ageing [3, 5, 6]. Accordingly, a hydrogen sulfide treatment suppresses the negative effects of oocyte ageing, such as parthenogenetic activation and oocyte/embryo death, in a dose-dependent manner . The mechanism of hydrogen sulfide action is well studied. Indeed, hydrogen sulfide-activated ATP-sensitive K+ (K+ATP) ion channels have been described, while L-type Ca2+ ion channels have also been shown to be inhibited by hydrogen sulfide [7, 8]. S-sulfhydration, a hydrogen sulfide-derived post-translational modification , is considered to be the mechanism of hydrogen sulfide action towards ion channels . Although the actions of hydrogen sulfide have been intensively studied in somatic cells, findings in gametes are rare [5, 11]. In the present study, we hypothesized that hydrogen sulfide also modulates the activity of K+ATP and/or L-type Ca2+ ion channels in aged oocytes. We used oocytes from the well-established biomedical model of the domestic pig (Sus scrofa) and explored possible ways to preserve the quality of oocytes and improve their availability for ART. We have observed a protective effect of hydrogen sulfide treatment on aged oocytes and subsequently revealed hydrogen sulfide to be a signalling molecule in oocyte [reviewed by 12]. Based on known targets of hydrogen sulfide with potent cell-protective activities , we pharmacologically induced the activation and inhibition of K+ATP and Ca2+ ion channels through minoxidil and verapamil treatment of aged oocytes, respectively. We tracked intact MII oocytes and all undesired oocyte phenotypes. All chemicals were purchased from Sigma-Aldrich (USA) unless otherwise stated. Pig ovaries were obtained from non-cyclic gilts at a local slaughterhouse (Jatky Cesky Brod, a.s., Czech Republic) and transported to the laboratory. Cumulus-oocyte complexes were collected from 3 to 5 mm follicles by aspiration using a syringe and 20G needle. Fully grown immature oocytes with intact ooplasm and compact layers of cumulus cells were selected for in vitro maturation in modified M199 culture medium for 48 h at 39 °C and 5% CO2 . Matured MII oocytes were denuded and subjected to further in vitro cultivation in modified M199 under standard conditions for 72 h .
During the 72 h in vitro culture of matured oocytes, minoxidil (K+ATP channel activator), verapamil hydrochloride (L-type Ca2+ channel blocker) or Na2S·9H2O was added. In further experiments, Na2S supplementation was combined with different concentrations of glibenclamide (K+ channel blocker) or BAY K8644 (L-type Ca2+ channel agonist). 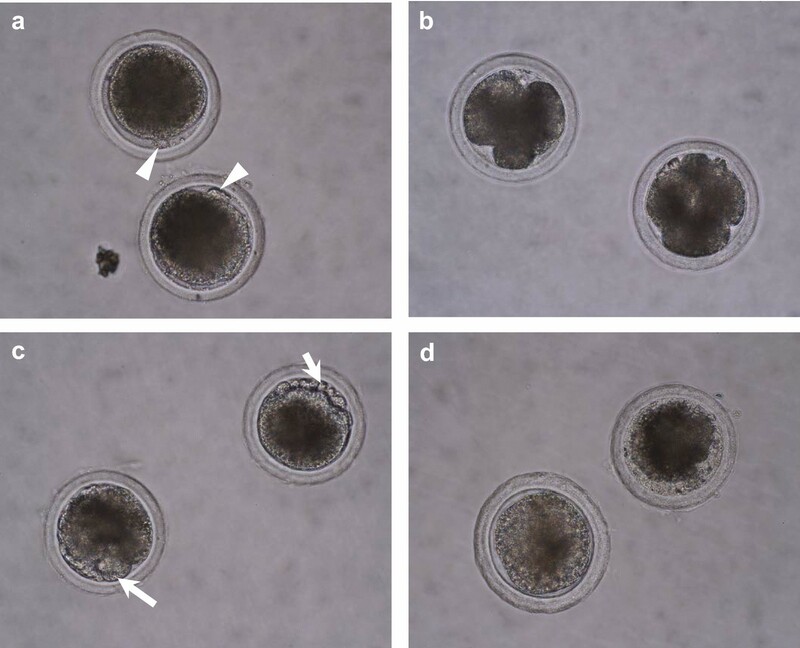 At the end of in vitro culture, aged oocytes were mounted on slides using Vaseline and fixed in acetic alcohol (1:3, v/v) for at least 48 h. Fixed oocytes were stained with 1.0% orcein and evaluated via phase contrast microscopy (Olympus, Germany). Aged oocytes were evaluated as follows: (i) intact MII oocytes without visible morphological changes; (ii) cell death, i.e. apoptosis (marked with visible apoptotic bodies, also called fragmentation) or lysis (necrosis) or (iii) parthenogenetic activation (recognized by spontaneous embryonic development). Ageing phenotypes are shown on Fig. 1. Data from 120 oocytes per group in three independent experiments are expressed as the mean ± S.E.M. The data were processed using Statistica Cz 12 (StatSoft, USA). For comparisons of the study groups, one-way ANOVA (for quantitative variables) was used. In the case of a significant overall finding, differences between individual group pairs were assessed using the Bonferroni post hoc test. The level of statistical significance was set at α = 0.05. We observed an improvement in oocyte quality following the modulation of ion channel activity using the K+ and L-type Ca2+ channel activator and inhibitor, respectively. 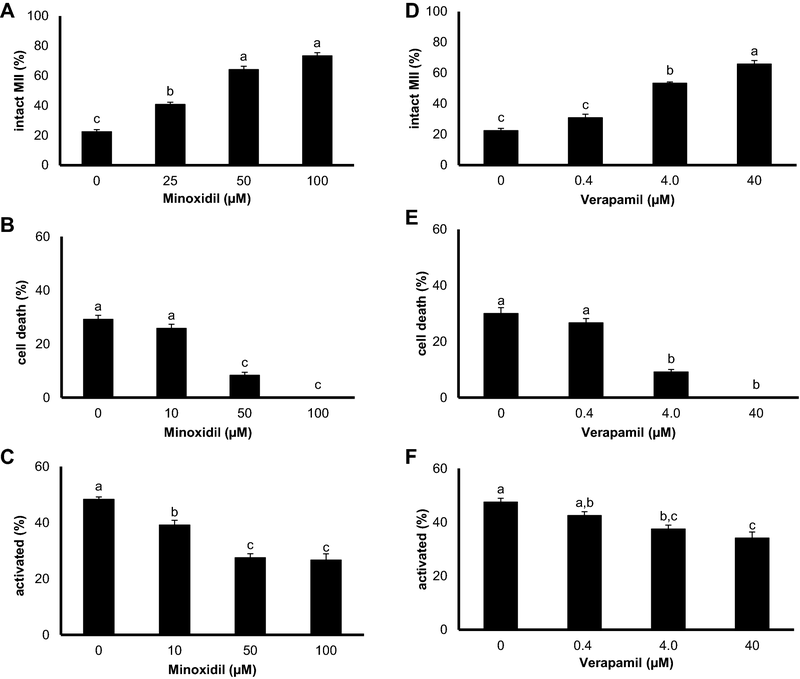 Both agents yielded a dose-dependent increases in the number of intact MII oocytes (Fig. 2A, D), along with the suppression of cell death, such as apoptosis or lysis (Fig. 2B, E). The positive effect of hydrogen sulfide on oocyte ageing , as well as its ability to modulate ion channel activity [reviewed by 7] have been described. Therefore, subsequent experiments were performed using combined treatment with a hydrogen sulfide donor and modulators of ion channel activity. Based on the aforementioned protective effect of hydrogen sulfide , we speculated that K+ channel activity has a positive effect on aged oocytes. 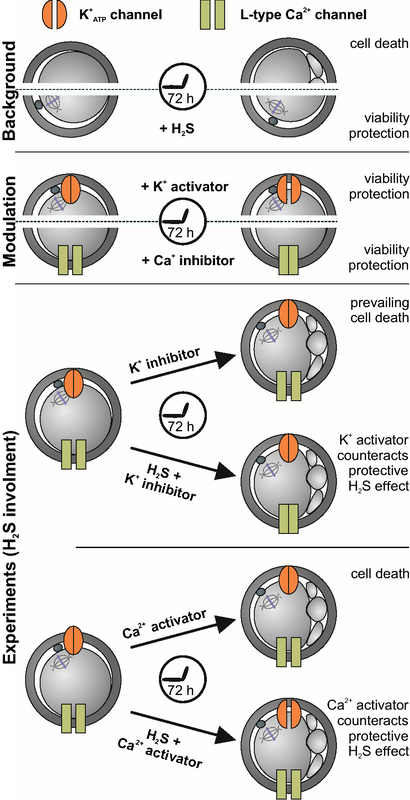 Moreover, the ability of hydrogen sulfide to modulate ion channel activity is known [7, 8], as is the protective effect of K+ATP channel activation alone (see above). 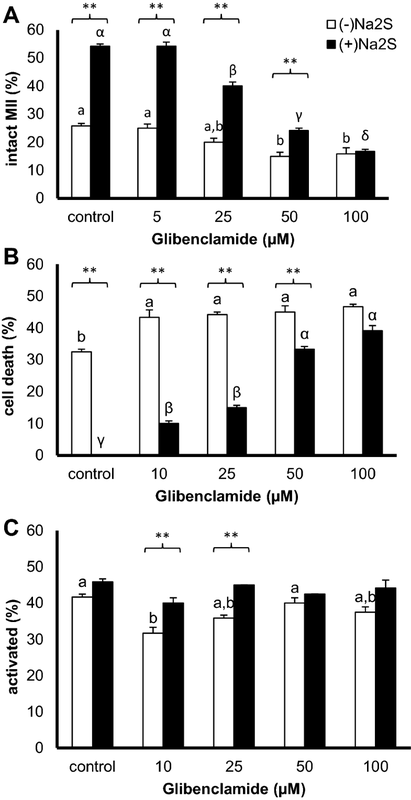 Based on the ability of hydrogen sulfide to activate K+ATP channels, we sought to reverse the positive effect of the hydrogen sulfide donor using glibenclamide, a K+ATP channel blocker (iKATP). As expected, iKATP impaired the quality of aged oocytes compared with control oocytes aged in pure medium (Fig. 3; (−)Na2S). In contrast, addition of a hydrogen sulfide donor alone (control oocytes for (+)Na2S treatment) increased the intact MII oocytes up to 54.2 ± 0.8% (Fig. 3A), while oocyte apoptosis/lysis (cell death) was completely inhibited (Fig. 3B). iKATP reduced the hydrogen sulfide-increased portion of intact MII oocytes after 72 h of oocyte ageing in a dose-dependent manner (Fig. 3A). While hydrogen sulfide-treated oocytes showed a significantly decreased prevalence of oocyte cell death (Fig. 3B), iKATP treatment reversed the positive effect of hydrogen sulfide (Fig. 3A, B). The observation is consistent with the general assumption that hydrogen sulfide acts as a K+ATP ion channel activator, as evidenced in vascular smooth muscle cells , cardiomyocytes , neuronal cells  and/or pancreatic beta cells . In addition to K+ATP channels, we tested the role of Ca2+ channels in hydrogen sulfide-protected oocytes. 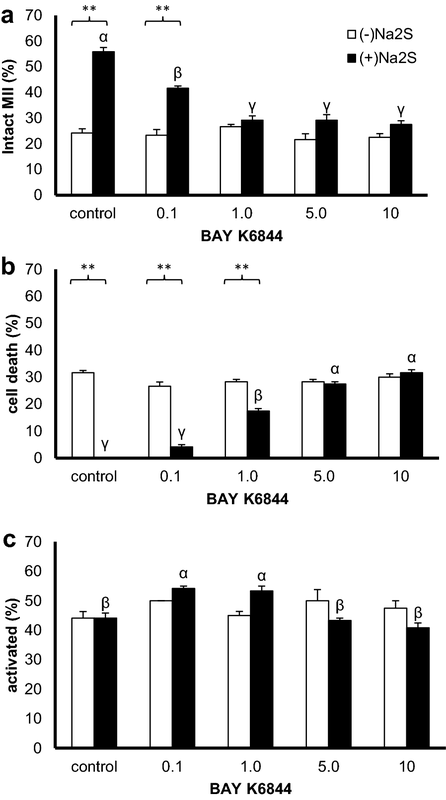 Consistent with our observation of the beneficial effect of Ca2+ channel inhibition (see above), we experimentally reversed the positive effect of the hydrogen sulfide donor using BAY K8644 an activator of L-type Ca2+ channels (aCa). Different concentrations of the Ca2+ channel activator ((−)Na2S) had no observable effect on oocyte phenotypes (Fig. 4). When coupled with hydrogen sulfide donor treatment ((+)Na2S), Ca2+ channel activation suppressed the protective effect of hydrogen sulfide on MII oocytes (Fig. 4a). Additionally, the reduced occurrence of oocyte apoptosis or lysis (i.e., cell death, Fig. 4b) induced by hydrogen sulfide was reversed by addition of the Ca2+ channel activator. Our evidence suggests that hydrogen sulfide exerts is ageing-preserving effect through the suppression of Ca2+ channels. Our findings are in accordance with the observed intracellular Ca2+ elevations that accompany oocyte ageing . On the other hand, the modulatory effect of hydrogen sulfide on Ca2+ channels is somewhat inconsistent, as hydrogen sulfide is known to activate T-type Ca2+ channels in neurons . Therefore, the effect of hydrogen sulfide on Ca2+ ion channels in spermatozoon and/or embryos requires further study. Hydrogen sulfide supplementation represents a possible method of protecting against undesired phenotypic changes in oocytes (Fig. 5). Our observations indicate that hydrogen sulfide is able to activate the K+ATP channel and inhibit the L-type Ca2+ channel. To the best of our knowledge, S-sulfhydration of cysteine thiols in proteins is a likely molecular mechanism for the effects of hydrogen sulfide in gametes and embryos. Further study and understanding of the action of hydrogen sulfide is necessary for translation to ART, which still include many undefined factors and have variable success rates. JN, TZ and KH interpreted the data and drafted the manuscript. MS and PH carried out statistical analysis. AP participated in data interpretation. JP conceived the study, performed experiments and drafted the manuscript. All authors read and approved the final manuscript. This work was supported by the National Agency of Agriculture Sciences (NAZV QJ1510138) and the Czech Ministry of Agriculture (MZeRO 0718); JN MS and PH were supported by the Charles University Research Fund (Progres Q39) and the National Sustainability Program I (NPU I) Nr. LO1503 provided by the Ministry of Education, Youth and Sports of the Czech Republic.